What's sweet and pretty and filled with all kinds of feel good vibes? I don't know about you, but today's party palette of pink and yellow sure is giving me a good dose of Spring fever. I know, I know, I'm crazy! But there's something so beautiful about that time of year when Winter turns to Spring and everything starts to bloom again. 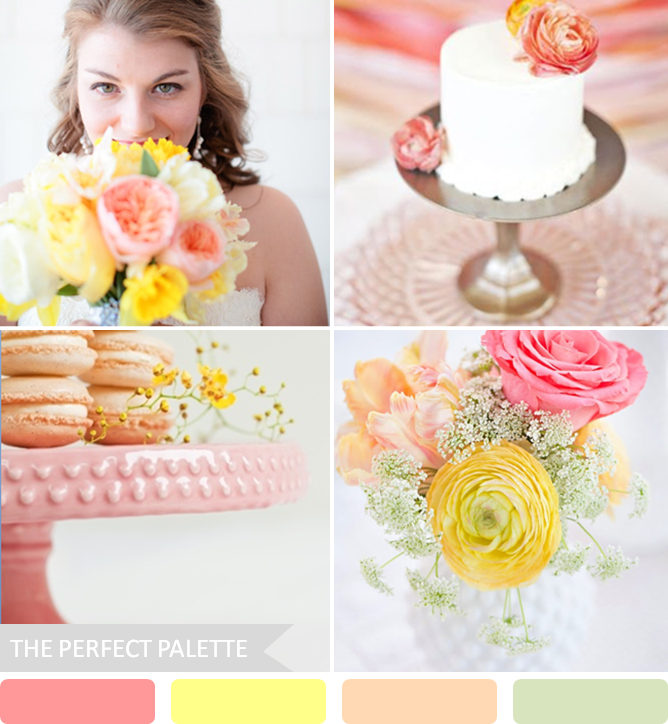 Perfect for bridal showers and Spring weddings alike, these colors really do radiate a sweet sort of happiness. Wouldn't you agree? Plus these colors work great with simple, non-fussy ideas. Like this simple white cake adorned with floral accents. So what do you think? Do these Spring colors stir up a sense of happiness in you? I don't know what it is, but one look at these colors and I just can't help but smile. 15 Comments " Spring Soiree | Shades of Pink and Yellow "
A glorious breath a fresh air! Those ranunculus! They're just so cheery! What a whimsical color palette, perfectly suited for the upcoming spring season! Gorgeous colors! That bouquet and cake are amazing. Perfect for spring. I love pink and yellow for spring! I've always said my best friend is my diamond, but that's just because the love of my life gave it to me! I sometimes glance down at my ring while I'm at work and it's like falling in love all over again. It's SO beautiful. Love the freshness of this combo! Such a fresh and fun combination! So light and joyful - you brightened my day with these colors! Absolutely love this colour combination!